The Crypt in Camberwell , by guest critic Peter Clasen. Thank you Peter for the updates on the Crypt stage gigs at Ealing this week and the Secondlife "virtual club" due to launch in November. Here's what it says on the tin, or rather on the Crypt's website. "Top Bands - Cheap Bar - Low cost Quality Food - 300 year old atmosphere - you can't go wrong!" Well, that's all my boxes ticked. Most importantly, the music is good. Perhaps because it is only open one night a week -Friday- there never seems to be any compromise in the quality of musicians, so it is somewhere where the music can be taken on trust. The acts are chosen by club directors including Simon Fernsby, who finds a good mix of usually British talent (eg. I can remember good gigs from Tony Kofi, Gareth Lockrane, Martin Speake, Phil Robson and Kate Williams). Looking ahead, there are some cool F-IRE names, some freer stuff and stalwart horn players like Renato D’Aiello and Dave O'Higgins booked for forthcoming Fridays. You should expect to hear quality, creative musicians trying out their latest projects, probably playing originals with a more familiar Monk or ballad thrown in. Music starts at 9.30, and the venue closes two sets later around 1am. Next there is a good respectful listening audience, although on occasion the non-music-listeners can drown out a quiet intro or a bass solo - like everywhere. This is probably because about half the seating is tucked away from the tiny bandstand, and it takes a dedicated music fan to listen carefully without a line of sight! For that reason, it's worth getting there early if you want to listen carefully. But musicians I have spoken to seem to like playing there because people listen. Officially its capacity is 150 people, but the atmosphere is much more intimate than that number suggests: it feels more like a private party in someone's cellar. Around that solid foundation of great music, there are numerous little advantages to complete your evening. There's tasty and amazingly cheap food (vegetarian, but you can't have everything and the puddings make up for it). Even though the Crypt is not the sort of place to find a banjo, there is a selection of beer and ales in bottles that would make a trad-jazzer's heart sing. The entry is very good value at £6 (/£4). 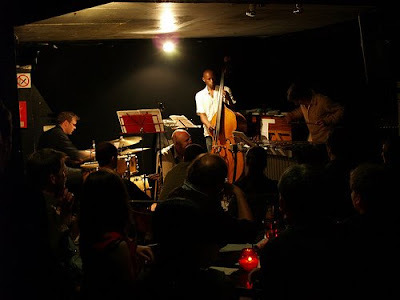 Russell Occomore, who started the club going in 1995 with Les Alden by negotiating with the church, says he wanted to reflect the vibrancy and the talent within the London and UK jazz scene: with his partners at Jazzlive he has certainly managed to achieve that. On a more trivial matter, he acknowledged the piano was ropey, but explained that it's hard to keep a piano in tune underground, and that the club simply doesn't have the money to buy and maintain a better one. Jazzlive also book the Crypt Stage at Ealing Jazz Festival, and are reaching out yet further by setting up a virtual club in Secondlife: from November its gigs will be streamed there live. Camberwell Green is well served by buses (36, 171, 345, 12) which link the club to Oval, Elephant and Castle and Brixton , all roughly two miles away- and you might find that you have saved so much money with the Crypt's cheap entry, food and drinks that you can splash out on a taxi home! "It's perfect for a duo"